EIGHT-YEAR-OLD Jack could hardly believe his eyes when a letter with a Buckingham Palace post mark arrive at his home in Devizes. 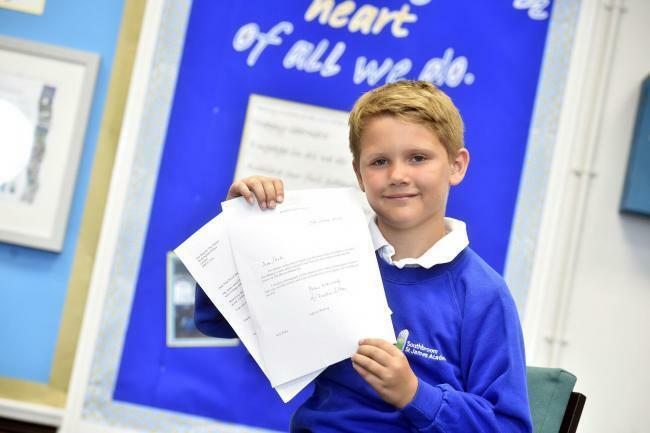 Jack, who is a pupil at Southbroom St James Academy, had got so involved in a school history project that he decided to write to the Queen to ask her for help. Jack did not really expect the monarch to respond to his request for picture of herself that he could include as part of his project. But he was delighted to open the letter to find not just a picture of the Queen but also a family tree of British monarchs. He said: "I was very surprised." His teacher Kelly Bruce was impressed with his resourcefulness. She said: "I am incredibly pleased for Jack to have this letter from Buckingham Palace. "He chose to extend his own learning at home by sending this letter as we have been learning about the monarchy from William the Conqueror through until present time. "Jack has really enjoyed our topic so far showing a real passion and enthusiasm for it. He is very hard working and it is lovely to see someone who enjoys learning as much as he does get a reward of this kind from the Queen herself." In his letter Jack told the Queen his name, age and school and about his school project and said: "I can use your reply as part of my homework and share it with my class, teacher and school." He signed off by saying he hoped she had had a good birthday. In reply Lady-in-Waiting Richenda Elton said on behalf of the Queen: "I enclose a photograph of the Queen and a little information which I hope you will like to have and I am to to thank you, once again, for writing as you did." Mrs Bruce said that all of the children in her Year 4 class were excited to hear Jack's news and to see the letter written on Buckingham Palace headed writing paper.